Few contemporary directors walk the line between the sublime and the ridiculous as closely as Tarsem. Mirror Mirror sees the artsy Indian director, whose previous credits include The Cell, The Fall and Immortals tackle the potent but unsettling fairy tale Snow White (which tells the story of a young princess, cast out by her vein stepmother only to be saved by a group of dwarfs and the prince she loves) with a campy sarcastic comedic style; a welcome approach given the story’s old fashioned subtext, hinging on the value of pale skinned youthfulness. Combining laughs with Tarsem’s meticulous surrealistic aesthetic might seem a little odd, but it works surprisingly well. However, the film gets off to a something of an uneasy start with the narration by the evil Queen (Julia Roberts). 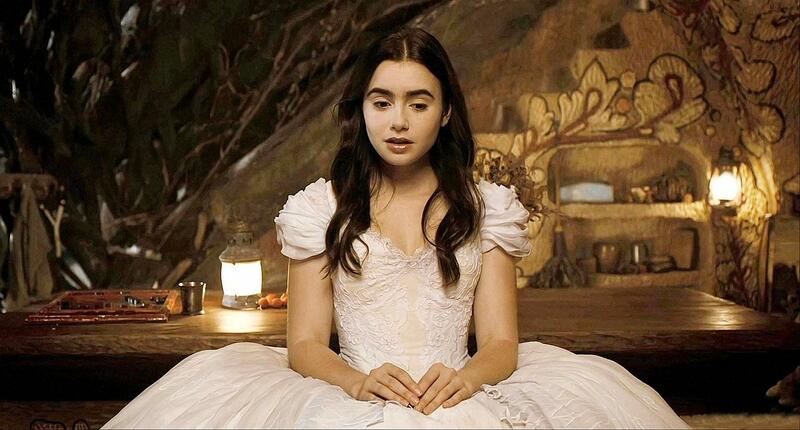 Tarsem plays with the idea of whose story Mirror Mirror actually is, the Queen’s or Snow White’s (Lilly Collins). The Queen insists the story belongs to her, but we all know it is Snow White’s – this gives us a feeling akin to starting off on the wrong foot. As soon as the Snow White character is established though Tarsem gets the storytelling on track. Lilly Collins, for what its worth, is charming as Snow White and refreshingly she doesn’t possess a sickly facade of innocence – this bolsters the film’s self-knowing irony. Collins also plays counterpoint to Roberts’ vein and frankly annoying Queen, giving the dynamic an essential sense of balance. In line with his tongue in cheek interpretation Tarsem turns the ‘prince saves the princess’ cliche upside down; Collins’ Snow White becomes the motivating hero of the story, saving Prince Alcott (Armie Hammer). This is a significant choice as it undermines Snow White’s beatific innocence and makes her a much more robust female lead. This creates substantial laughs for the female section of the audience, at Armie Hammer’s expense. Despite its sardonic modern wit Tarsem’s take on Snow White still leaves us feeling slightly uneasy, as we remember that the story’s ultimate horror is to become anything but youthful and pale skinned. It is strange to see that the film doesn’t tackle the plot conclusion with ridicule, while the majority of the film is gladly tongue in cheek. With this said the film does end on a slightly bizarre and unexpected high with a fun Bollywood-style credit sequence – a unmistakable nod to Tarsem’s Indian contemporaries. Feeling like a mashup of slapstick comedy, Bollywood excess and surrealist pastiche Mirror Mirror is a film that just about comes together stylistically. However, in its treatment of the Brothers Grimm’s irrefutably dark story it would have still benefited from a more acidic kind of wit. It will be interesting to see how this film compares to Snow White and the Huntsman, Rupert Sanders’ darker cinematic take on the same story, due for release in the summer.